At the outset I would like to express New Zealand’s full support for the independence and work of the High Commissioner for Human Rights and his Office. We greatly appreciate the tireless, patient, and courageous work in promoting and protecting the enjoyment and full realization by all people, of all rights. Preventing human rights violations, securing respect for all human rights, and promoting international cooperation to protect human rights are all critical to sustaining the human rights pillar of the UN. 70 years on from the adoption of the Universal Declaration of Human Rights, it is timely to reaffirm New Zealand’s commitment to universality of human rights; to implementing our human rights obligations domestically and promoting human rights internationally. The Universal Declaration makes no distinction between different categories of rights – civil, cultural, economic, political and social rights are of equal importance and none can be enjoyed without the others. My government remains firmly committed to this approach. We also continue to support the right to development, as elaborated in the 1986 Declaration on the Right to Development, with the individual as “the central subject …the active participant and beneficiary”. 2018 marks the 25th anniversary of the Vienna Declaration and Programme of Action. A core component of the Vienna Declaration and Programme of Action is that: “Democracy, development and respect for human rights and fundamental freedoms are interdependent and mutually reinforcing”. Like others, we are seriously concerned at the global erosion of hard-won gains on democracy, human rights and respect for the rule of law. The international community does not lack for appropriate norms and standards – only the political will to implement. The global gap between the obligations and commitments and the implementation at country level is extremely concerning. Sustainable peace and development in some cases requires the full and equal enjoyment of human rights by all. Human rights violations and abuses are often root causes of conflicts and can act as early warnings of impending disasters. We look to the Human Rights Council to more fully implement its mandate in preventing human rights emergencies and responding to early warnings in the years to come. The international human rights framework must be upheld, defended, and progressively developed. Human rights defenders play a critical role in supporting this architecture, and in holding governments to account on their human rights obligations and commitments. A vibrant civil society is a cornerstone of a legitimate and flourishing democracy. We are alarmed by international reports of reprisals against human rights defenders and their families, especially as a result of cooperation with the UN, its representatives and mechanisms. New Zealand fully supports the on-going work by Assistant Secretary General Gilmour to strengthen the consequences against governments who commit reprisals. As High Commissioner Zeid has said, “Upholding human rights is intrinsic to the obligations of sovereignty, and constitutes the fundamental basis for a healthy State”. In this regard, the global abolition of the death penalty, in law and in practice, is one of our top international human rights concerns. New Zealand regards the imposition of a death sentence or the use of the death penalty as running afoul of the prohibition of torture and cruel, inhuman or degrading treatment or punishment. Sovereignty cannot justify torture. In the Human Rights Council we are proud to lead a resolution on ‘preventable maternal mortality and morbidity’, in partnership with Colombia and Burkina Faso. Globally, 800 women and girls die from pregnancy or childbirth every day. High rates of maternal mortality and morbidity is a tragic consequence of depriving women and girls of their human rights, including the right to the highest attainable standards of sexual and reproductive health. Women must have their right to decide if, when and how often to reproduce, free of discrimination, coercion and violence, fully respected and fulfilled. We recognise that particular civil and political rights and freedoms may be of little value to someone suffering from extreme poverty, hunger, or a lack of access to universal health-care. When the Universal Declaration on Human Rights was being negotiated, New Zealand’s delegate stated “Experience in New Zealand has taught us that the assertion of the right of personal freedom is incomplete unless it is related to the social and economic rights of the common man. From this year onwards first year tertiary students pay no fees and this will increase to the first three years by 2024. Overhauling the mental health system starting with a comprehensive review of our mental health system, which will deal with some of the challenging elements of the Convention of the Committee’s jurisprudence. Taking immediate measures to address the housing crisis with an ambitious programme to build an additional 100,000 houses (a 5% increase) over 10 years, including affordable homes, social housing and emergency housing. Later this week I will lead New Zealand’s delegation for our review by the Committee on Economic Social and Cultural Rights. We greatly value the work of the human rights treaty bodies, as we strive for the highest standards of implementation of all the conventions to which we are a State party. We are proud to have a New Zealander, Robert Martin, serve on the Committee on the Rights of Persons with Disabilities. Our ongoing work on the rights of persons with disabilities in the Human Rights Council and in the Third Committee in New York is matched by our commitment to implement the Convention on the Rights of Persons with Disabilities. The rights of indigenous peoples will always be a priority issue for New Zealand. In 1840 the Treaty of Waitangi was signed between the British Crown and around 540 Maori chiefs. In 1975 the Waitangi Tribunal was established as a commission of inquiry to settle alleged breaches of the Treaty by the Crown. As the Treaty of Waitangi Negotiations Minister, I aim to complete the settlement of historical treaty claims as expeditiously as possible. At the international level, we support the UN Declaration on the Rights of Indigenous Peoples, and look forward to constructive engagement with the Expert Mechanism on the Rights of Indigenous Peoples, with their recently strengthened mandate focused more squarely on the Declaration. 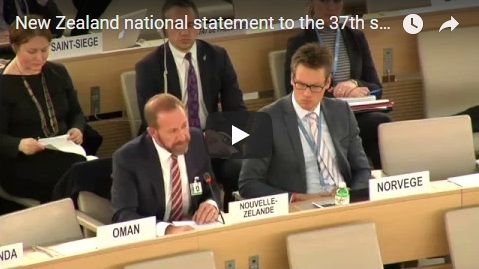 New Zealand has a long history of constructive and principled engagement on human rights. This year we are celebrating the 125th anniversary of women’s suffrage in New Zealand – we were the first country in the world where women gained the right to vote. This history must inspire us to remain vigilant and redouble our efforts in domestic implementation of all civil, cultural, economic, political and social rights for all New Zealanders. We look forward to our Universal Periodic review in January 2019, when we can benefit from the collective experience and wisdom of the international community and receive your recommendations on how to improve the human rights situation in New Zealand. Our commitments to strengthening human rights generally in New Zealand is reflected in the recent commitment the government made to confirm in statute the right of domestic courts to declare laws to be inconsistent with our legislation that sets out our fundamental human rights, the New Zealand Bill of Rights Act. Not only will the courts have the right to declare an inconsistency, but any such declaration will require Parliament to respond by affirming, amending or repealing the offending law. A state’s commitment to, and upholding human rights is vital in order to allow every person to enjoy the full benefits of citizenship equally. The proper observance of individual human rights is the basis of identity, freedom and prosperity.